Until recently, no formal business model design tools existed. Entrepreneurs had no choice but to use their experience and wits to create business models. Sometimes this unstructured approach worked, and sometimes it didn’t. The founders of Southwest Airlines may have been successful doodling their business model on the back of a cocktail napkin, but you’ll be better served with a more structured approach. The following three templates are available to aid you in the creation of your business model. Alexander Osterwalder and Yves Pigneur delineate a framework for a business model, which you can see on the Business Model Generation website. Osterwalder and Pigneur’s Business Model Canvas can be used to brainstorm business model concepts as well as see their interactivity. The canvas is particularly useful in group sessions where brainstorming can be harnessed. The business model designer writes key ideas or principles in the appropriate boxes on the canvas. From there, the most powerful concepts and inter-relationships can be uncovered and developed. 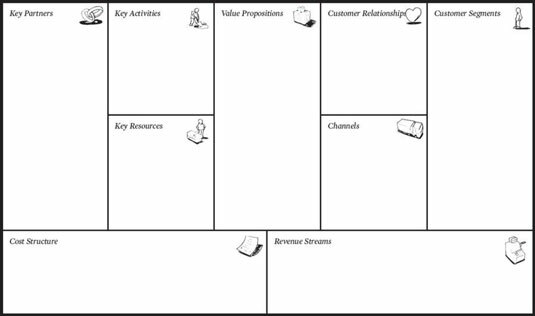 This figure shows the Business Model Canvas. Mark W. Johnson proposes a four-box business model, which you can see on his website, Seizing the White Space. Johnson’s primary focus is to help companies innovate their business model into “white spaces” that are highly profitable and less competitive. 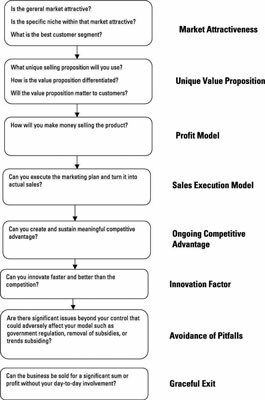 Creating a new business venture is akin to ongoing business model innovation, so Johnson’s format can be a good tool to assist in structuring a business model. You may prefer the four-box model, shown in this figure, because it’s a bit broader than Osterwalder and Pigneur’s nine-category model and highlights the interplay between factors more prominently. 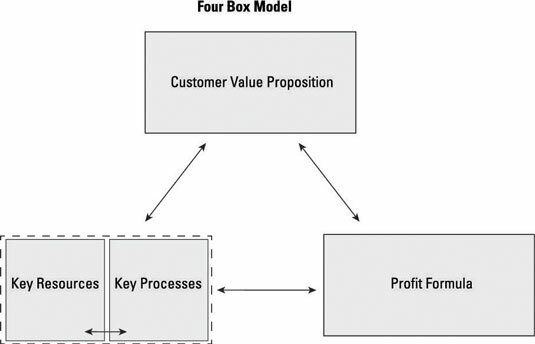 The four-box model, as shown in this figure, focuses on the interplay between customer value proposition, profit formula, key resources, and key processes to decipher a business model. The Business Model Institute (BMI) has created an eight-part wheel-shaped framework to create and analyze a business model. Unlike the other templates, this version is less theoretical and more practical. The BMI framework starts with the premise that all great business models have: an outstanding offer, the ability to monetize the offer, and the ability to sustain it. Market attractiveness: Selling your product to the right combination of market, niche, and customer can have a big effect on your profitability. Unique value proposition: Does your product solve a compelling need that the customer can’t fill elsewhere? Does the offering provide far more value to the customer than it costs? Does the offering tap an unserved or underserved market? Were you first to market with this proposition? Are similar offerings available? These factors and more comprise your unique value proposition. Profit model: How much profit can you make selling the product? How does the interplay among different products sold affect profitability? Do you have a cost advantage? Will your revenue be recurring or a one-time hit? Factors like these make up the profit model. Sales performance model: Will you be able to sell the product for as much as you think? Can you attract customers via marketing, or will you need a heavy sales effort to push the product to the market? Can you create a proven and repeatable sales process? The sales performance model brings factors such as these into the overall business model. Ongoing competitive advantage: Do you possess any of the classic competitive advantages, such as cost advantage, differentiation, or access to resources? Will your model allow you to maintain and grow this advantage? Are large competitors entering your market? Is the bargaining power of buyers increasing or decreasing? These factors and more comprise your business model’s ongoing competitive advantage. Innovation factor: Every business needs to innovate, but how much? A parking lot maintenance company needs to innovate to stay competitive, but not as much as Intel needs to innovate. Your innovation factor is the proper balance between your need to innovate and your ability to innovate. Avoidance of pitfalls: Unfortunately, you can have a great product sold for high profits to a great customer niche and still have issues with your business model. Governmental regulation (or the removal of it — as was the case with airlines and telecom), severe location handicap, overreliance on trends/fads, or legal issues can damage an otherwise good model. Graceful exit: Most businesses are mid-sized and small businesses. These businesses don’t have public stock to make the owner’s stake liquid. Smaller businesses need to allow the owner(s) to turn their years of hard work into cash or a stream of income — also known as a graceful exit. A business model can be outstanding in all other regards but still not provide a graceful exit to the owners. These areas cover every aspect of a business model. Check out this figure to see the logic flow to create a business model. By addressing all eight areas of a business model and weighing them appropriately, you can perform a complete analysis of your model. 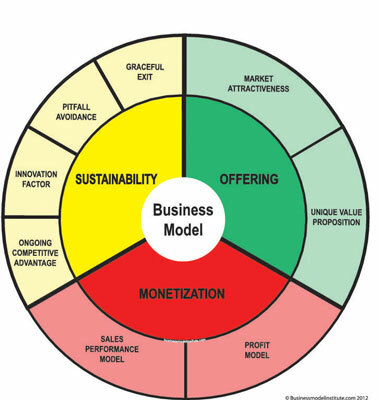 The graphical representation of the Business Model Institute’s wheel framework is shown in this figure. Credit: Figure used with permission from the Business Model Institute.